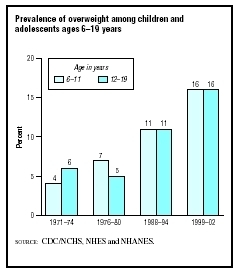 Nutrition is a primary factor for weight management of obese children and adolescents. Poor nutrition and dietary habits can lead to weight gain and obesity. Dietary modification is important for helping children lose weight and prevent obesity. Limit soft drink consumption to one per day or less. One 12-ounce can of soda has 120 calories or more. Often, children and adolescents consume "super-size" sodas that may contain up to 1,000 calories. Limit fast food restaurant visits to one per week, and choose healthy options like grilled chicken and smaller sized portions of high-calorie items. Increase consumption of fruits, vegetables, high-fiber foods, and whole-grain foods. Be aware that "low-fat" foods often substitute sugar for fat, and calories may actually be the same as the regular or high-fat version.